For some of you, this may be a simple job but for those who don’t know..here is a step by step guide on how to change the coolant in your car and to flush clean the radiator at the same time. You should also learn how it works and the critical role it plays in your engine’s cooling system. Coolant or anti-freeze (as it is called here due to extreme cold weather) is what enables the car’s engine to dissipate the heat it generates while in operation. It is fed to the engine via a rubber or silicone hose originating from the radiator. Coolant is always better than water since water evaporates after a certain temperature level while coolant can withstand much higher or lower temperature. For most Japanese cars under normal driving conditions, it is recommended to be replaced anywhere around 40-50,000 KMs. This DIY was done on a friend’s 02 Honda accord a while ago so the process is absolutely similar for Honda cars and im certain that it will not be very different for most other cars out there. This car took about 5 to 5.5 ltrs of coolant….so you need to know how much coolant needs to go in your radiator. Smaller cars may take less so it is a better idea to have some extra cuz you will also have to fill the reservoir plus if some is left….u can use it later when needed. Remember…if you mix it yourself…make sure it is 50:50 with water. I always use OEM Honda coolant but my friend Lee is a cheapster. Make sure that the engine is cool if you have recently driven the car….never play around the engine bay if it is still hot and you don’t know what you are doing. Park the car on a level ground (preferably in a shade) and have the following items ready…. Open the hood and locate the radiator cap…it is usually towards the front side of the car. Open the radiator cap and visually inspect the liquid inside….is it clean…clear…is it rusty or you don’t see anything at all…lol. Put the cap in a safe place and don’t leave it on anywhere in the engine area…you don’t wanna loose it. Tip: Always use OEM or a good quality radiator cap…a cheap quality one will die on you sooner or later. Make sure the round rubber O-ring gasket on the cap is in good condition. If it is cracked…get a new cap altogether. While wearing your glove or a cloth that covers your hand properly…twist open the drain plug and let the liquid flow out of the radiator body. If you cant access it from the top….you will have to get underneath the car to locate it….if you do this…I recommend you jack up the car a little bit to give yourself some room to operate down there. The old liquid will start to flow right when u open the drain plug…don’t worry if some of it gets on your hand…it is not harmful to your skin but try to avoid contact as much as possible. I always use a water proof glove. Let the coolant drain fully….check the pic below. Let this process happen for about 10 minutes or so to make sure all of it is drained. Keep an eye on the container to ensure the liquid is not falling outside of it. 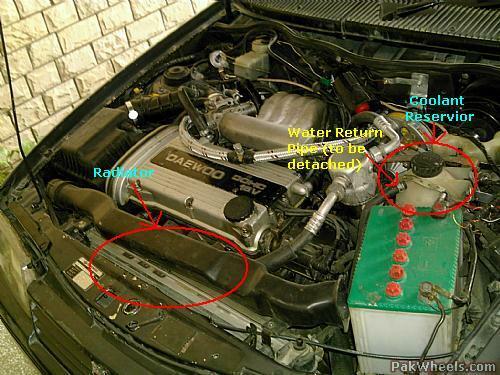 While the coolant is being drained from the radiator…locate the reservoir and remove its top. The reservoir might have some old liquid left…take it all out and empty the reservoir. It is a good idea to wash it also. Once done…put it back the way it was. Tip: Press the rubber hose with your fingers…see if you can feel it cracking from inside..if that is the case…its time to get a new hose. Once the old liquid is drained…its now time to flush the radiator (with water..not the coolant or the coolant mixture). The way I do it is this…..
b) Then…put the drain plug back on…fill the radiator with water again…put on the radiator cap…and start the engine and let it warm up. Turn the heater to full and wait for a few minutes. Now touch the top radiator hose to see if it warm…if it feels hot….that means the thermostat was activated and water is now flowing through the hose. Now shut off the engine and let it cool for a few minutes. Open the drain bolt again and let all the water flow out completely one more time. Don’t just throw the coolant or the liquid you drained anywhere…it is toxic and if you have pets around your house and if they drink it…it can be lethal..dont also throw it away in your garden as it will kill the grass or plants. I have to unfortunately follow a lot of laws in this country…haha…so I have to take it to a shop to have them properly dispose it. In your case..you can do that but chances are that you wont do it….haha…just dispose it in an open sandy area…make sure you cover it with sand and dirt. The last step is to fill the new coolant…put the drain plug back on and make sure you tighten it properly. Also..check the condition of the plug itself…if it is damaged. Put a pourer / kupee into the radiator opening and start to fill it with the new coolant or coolant mixture. Fill it all the way to the top till it reaches the surface. Next…fill the coolant reservoir to the maximum level. Put the radiator cap back on and make sure the reservoir cover is also tightened. Now start the car again and wait for a few minutes for it to heat up….check if your A/C and heater is working. Hopefully it should and you are now done. It takes a little effort but if you do it right…you will ensure you have a cooling system that is in proper condition. I recommend you guys to do it more often because Pakistani driving conditions are very hot and cars take a lot more beating. Thanks a lot . It was helpful. Can you please recommend best coolant that easily available ? I use Caltex coolant. It is 100% pure coolant. Depending on where you live the ratio should be a minimum of one part coolant and two parts water. For example if the cooling system capacity is 6 litres, then use 2 litres of coolant and 4 litres water.